What to know: Combines original songs and old favorites with a healthy helping of what children do best - PLAY. Kids definitely enjoyed this more than the adults. "Yes, we like to finger paint." "Yes, we did watch it again." "This video makes me want to go to the beach. Right now!" "It's a good movie. It has cars and cooking." "I loved the firefighter." "I liked everything in it, especially the water." Well produced with clear images and audio. The songs are catchy; varying from quite wonderful to forgettable. Kids can relate to most of the activities such as playing with trucks, dancing and bathing. The food could have been more healthy and the constant inclusion of Little Tike products tends to get a wee bit too commercial. Fun and safety are stressed although they missed a beat with some tricycle action without helmets. 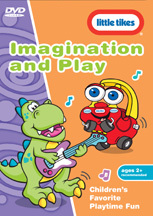 Combines original songs and old favorites with a healthy helping of what children do best - PLAY. Little hands and feet with big imaginations come together for a magnificent day of fun.